Nephrotic-range proteinuria is the loss of 3 grams or more per day of protein into the urine or, on a single spot urine collection, the presence of 2 g of protein per gram of urine creatinine. Nephrotic syndrome is the combination of nephrotic-range proteinuria with a low serum albumin level and edema. Nephrotic syndrome has many causes, including primary kidney diseases such as minimal-change disease, focal segmental glomerulosclerosis, and membranous glomerulonephritis. Nephrotic syndrome can also result from systemic diseases that affect other organs in addition to the kidneys, such as diabetes, amyloidosis, and lupus erythematosus. Nephrotic syndrome may affect adults and children of both sexes and of any race. It may occur in typical form, or in association with nephritic syndrome. The latter term connotes glomerular inflammation, with hematuria and impaired kidney function. Nephrotic syndrome may occur in persons with sickle cell disease and evolve to renal failure. Membranous nephropathy may complicate bone marrow transplantation, in association with graft versus host disease. From a therapeutic perspective, nephrotic syndrome may be classified as steroid sensitive, steroid resistant, steroid dependent, or frequently relapsing. The above causes of nephrotic syndrome are largely those for adults, and this article will concentrate primarily on adult nephrotic syndrome. However, nephrotic syndrome in infancy and childhood is an important entity. For discussion of this topic, see Pediatric Nephrotic Syndrome. However, studies of humans with tubular transport defects suggest that the glomerular urinary space albumin concentration is 3.5 mg/L. At this concentration, and a normal daily glomerular filtration rate (GFR) of 150 liters, one would expect at most 525 mg per day of albumin in the final urine. In health, urine albumin is less than 50 mg/day, because most of the filtered albumin is re-absorbed by the tubules. Amounts above 500 mg/day point to glomerular disease. The glomerular capillaries are lined by a fenestrated endothelium that sits on the glomerular basement membrane, which in turn is covered by glomerular epithelium, or podocytes, which envelops the capillaries with cellular extensions called foot processes. In between the foot processes are the filtration slits. These three structures—the fenestrated endothelium, glomerular basement membrane, and glomerular epithelium—are the glomerular filtration barrier. A schematic drawing of the glomerular barrier is provided in the image below. Filtration of plasma water and solutes is extracellular and occurs through the endothelial fenestrae and filtration slits. The importance of the podocytes and the filtration slits is shown by genetic diseases. In congenital nephrotic syndrome of the Finnish type, the gene for nephrin, a protein of the filtration slit, is mutated, leading to nephrotic syndrome in infancy. Similarly, podocin, a protein of the podocytes, may be abnormal in a number of children with steroid-resistant focal glomerulosclerosis. The glomerular structural changes that may cause proteinuria are damage to the endothelial surface, the glomerular basement membrane, or the podocytes. One or more of these mechanisms may be seen in any one type of nephrotic syndrome. Albuminuria alone may occur or, with greater injury, leakage of all plasma proteins (ie, proteinuria) may take place. Proteinuria that is more than 85% albumin is selective proteinuria. Albumin has a net negative charge, and it is proposed that loss of glomerular membrane negative charges could be important in causing albuminuria. Nonselective proteinuria, being a glomerular leakage of all plasma proteins, would not involve changes in glomerular net charge but rather a generalized defect in permeability. This construct does not permit clear-cut separation of causes of proteinuria, except in minimal-change nephropathy, in which proteinuria is selective. There are two current hypotheses for the formation of edema in nephrotic syndrome. The underfill hypothesis holds that the loss of albumin leading to lower plasma colloid pressure is the cause. The overfill hypothesis states that the edema is due to primary renal sodium retention. An increase in glomerular permeability leads to albuminuria and eventually to hypoalbuminemia. In turn, hypoalbuminemia lowers the plasma colloid osmotic pressure, causing greater transcapillary filtration of water throughout the body and thus the development of edema. 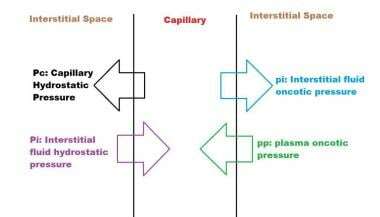 In this formula, Qw is net flux of water, K is the capillary filtration coefficient, Pc is capillary hydrostatic pressure, and pp is the plasma oncotic pressure, while Pi is the interstitial fluid hydrostatic pressure and pi is the interstitial fluid oncotic pressure, shown schematically below. With a high enough capillary hydrostatic pressure or a low enough intravascular oncotic pressure, the amount of fluid filtered exceeds the maximal lymphatic flow, and edema occurs. In patients with nephrotic syndrome, this causes a reduction in plasma volume, with a secondary increase of sodium and water retention by the kidneys. An alternative hypothesis is an intrinsic defect in the renal tubules which cause a decrease in sodium excretion. This could occur if the filtered intraluminal protein directly stimulated renal epithelial sodium reabsorption. Two facts support this hypothesis: (1) sodium retention is observed even before the serum albumin level starts falling, and (2) intravascular volume is normal or even increased in most patients with nephrotic syndrome. A third possible mechanism is an enhanced peripheral capillary permeability to albumin, as shown by radioisotopic technique in human studies of 60 patients with nephrotic syndrome. This would then lead to increased tissue oncotic pressure and fluid retention in the peripheral tissues. Acute kidney injury may indicate an underlying glomerulonephritis but is more often precipitated by hypovolemia or sepsis. Edema of the kidneys that causes a pressure-­mediated reduction in the GFR has also been proposed. Infection is a major concern in nephrotic syndrome. Both gram positive and gram negative bacterial infect. Varicella infection is also common. The most common infectious complications are bacterial sepsis, cellulitis, pneumonia, and peritonitis. Hyperlipidemia is a classic feature of the nephrotic syndrome, rather than a mere complication. It is related to the hypoproteinemia and low serum oncotic pressure of nephrotic syndrome, which then leads to reactive hepatic protein synthesis, including of lipoproteins. In addition, reduced plasma levels of lipoprotein lipase results in diminution of lipid catabolism. Some of the elevated serum lipoproteins are filtered at the glomeruli, leading to lipiduria and the classic findings of oval fat bodies and fatty casts in the urine sediment. When their study was published, in 1977, lipid-lowering treatments were less widely used than they are today. Accordingly, the average highest serum total cholesterol in this series was over 400 mg/dL. That is in the range of serum cholesterol seen in familial hypercholesterolemia, a disease that predisposes individuals to myocardial infarction. Low bone mass may be found in relation to cumulative steroid dose. However, intermittent corticosteroid treatment of childhood steroid-sensitive nephrotic syndrome was not associated with bone mineral deficits in one study. It is possible that long duration of either the nephrotic syndrome or treatments for it are the important risk factors for bone disease in these patients. Venous thrombosis and pulmonary embolism are well-known complications of the nephrotic syndrome. Hypercoagulability in these cases appears to derive from urinary loss of anticoagulant proteins, such as antithrombin III and plasminogen, along with the simultaneous increase in clotting factors, especially factors I, VII, VIII, and X. A study by Mahmoodi et al of almost 300 patients with nephrotic syndrome confirmed that the annual incidence of venous thromboembolism (VTE) was almost 10 times higher in these persons than in the normal population (1% vs 0.1 to 0.2%). Moreover, that risk appeared especially elevated during the first 6 months of nephrotic syndrome, being at almost 10%. This high incidence may justify the routine use of preventive anticoagulation treatment during the first 6 months of a persistent nephrotic syndrome. Mahmoodi et al's study also showed an increased risk of arterial thrombotic events in subjects with nephrotic syndrome, including coronary and cerebrovascular ones. Unlike the risk of VTE, which was related to proteinuria, this arterial risk was related to usual risk factors for arterial disease, such as hypertension, diabetes, smoking, and reduced GFR. Hypovolemia occurs when hypoalbuminemia decreases the plasma oncotic pressure, resulting in a loss of plasma water into the interstitium and causing a decrease in circulating blood volume. Hypovolemia is generally observed only when the patient's serum albumin level is less than 1.5 g/dL. Symptoms include vomiting, abdominal pain, and diarrhea. The signs include cold hands and feet, delayed capillary filling, oliguria, and tachycardia. Hypotension is a late feature. Common primary causes of nephrotic syndrome include kidney diseases such as minimal-­change nephropathy, membranous nephropathy, and focal glomerulosclerosis. Secondary causes include systemic diseases such as diabetes mellitus, lupus erythematosus, and amyloidosis. Congenital and hereditary focal glomerulosclerosis may result from mutations of genes that code for podocyte proteins, including nephrin, podocin, or the cation channel 6 protein. Nephrotic syndrome can result from drugs of abuse, such as heroin. The first mechanism could explain the secondary membranous nephropathy of systemic lupus erythematosus. The second mechanism appears to explain 70% of idiopathic membranous nephropathy. M-type phospholipase A2 receptor (PLA2R) antibodies are found in about 70% of patients who have idiopathic membranous glomerular nephropathy. These IgG antibodies are found both circulating in the plasma and deposited on the glomerular basement membranes. The third mechanism may explain the rare occurrence of nephrotic syndrome in subjects treated with enzyme replacement therapy for genetic enzyme deficiency diseases such as Pompe or Fabry disease [15, 16] This may result from allo-antibodies to the infused enzyme that are deposited on the glomerular basement membrane, with ensuing secondary membranous nephropathy. Nephrotic­-range proteinuria occurring in the third trimester of pregnancy is the classical finding of preeclampsia. It may occur de novo or it may be superimposed on another chronic kidney disease. In the latter case, the patient will have had preexisting proteinuria that worsened during pregnancy. Medication can cause nephrotic syndrome. This includes the very infrequent occurrence of minimal­-change nephropathy with use of nonsteroidal anti-inflammatory drugs (NSAIDs), and the occurrence of membranous nephropathy with use of gold and penicillamine, which are older drugs used for rheumatic diseases. Focal glomerulosclerosis can occur in association with intravenous bisphosphonates. Lithium and interferon therapy have been associated with focal glomerulosclerosis of the collapsing type. Nephrotic-­range proteinuria could occur with the use of anticancer agents, such as bevacizumab, that inhibit vascular endothelial growth factor (VEGF). However, the clinical picture of this complication is of a thrombotic microangiopathy rather than of nephrotic syndrome per se. The association of membranous nephropathy with cancer is a clinical dilemma. This association presumably results from immune complex injury to the glomeruli caused by cancer antigens. While about 6000 new cases of membranous nephropathy occur each year in the United States, 1.5 million new cases of non-skin cancer are diagnosed. Therefore, from the oncologist’s standpoint, the problem of paraneoplastic membranous nephropathy is trivial. However, a carefully performed analysis from France suggested that the cancer rate is approximately 10-­fold higher in persons with membranous nephropathy than in the general population, especially in individuals over age 65 years. In that study, 50% of membranous nephropathy cases were diagnosed before the diagnosis of cancer. Thus, in some patients with membranous nephropathy one should consider the possibility of an undiagnosed cancer. Incidence of important causes of nephrotic syndrome, in number per million population. The left panel shows systemic causes, and the right panel lists primary renal diseases that can cause nephrotic syndrome. fgs = focal glomerulosclerosis, MN = membranous nephropathy, min change = minimal-change nephropathy. Data are in part from Swaminathan et al and Bergesio et al. In parts of Africa and the Middle East (eg, Egypt), glomerular disease may be associated with urogenital schistosomal infection. However, so-called tropical nephrotic syndrome from parasitic diseases such as schistosomiasis or malaria may not be a true entity. There is a male predominance in the occurrence of nephrotic syndrome, as for chronic kidney disease in general. This male overrepresentation is also seen in paraneoplastic membranous nephropathy. But lupus nephritis affects mostly women. 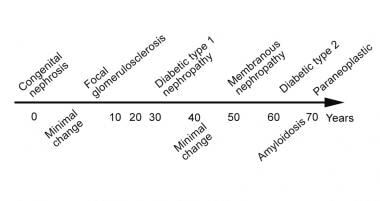 The image below shows typical ages at which a given cause of nephrotic syndrome may occur. It does not show every possible cause of nephrotic syndrome, such as lupus nephritis, which typically affects young black women. The ages shown are averages. In the pre-antibiotic era, infection was a major factor in the mortality rate among patients with nephrotic syndrome. Treatments for nephrotic syndrome and its complications have reduced the morbidity and mortality once associated with the syndrome. Currently, the prognosis for patients with primary nephrotic syndrome depends on its cause. Infants with congenital nephrotic syndrome have a dismal prognosis: survival beyond several months is possible only with dialysis and kidney transplantation. Only approximately 20% of patients with focal glomerulosclerosis undergo remission of proteinuria; an additional 10% improve but remain proteinuric. Many patients experience frequent relapses, become steroid-dependent, or become steroid-resistant. End-stage renal disease (ESRD) develops in 25-30% of patients with focal segmental glomerulosclerosis by 5 years and in 30-40% of these patients by 10 years. The prognosis for patients with minimal-change nephropathy is very good. Most children respond to steroid therapy; still, about 50% of children have one or two relapses within 5 years and approximately 20% of them continue to relapse 10 years after diagnosis. Only 30% of children never have a relapse after the initial episode. Approximately 3% of patients who initially respond to steroids become steroid-resistant. Adults with minimal-change nephropathy have a burden of relapse similar to that of children. However, the long-term prognosis for kidney function in patients with this disease is excellent, with little risk of renal failure. The prognosis may worsen because of (1) an increased incidence of renal failure and the complications secondary to nephrotic syndrome, including thrombotic episodes and infection, or (2) treatment-related conditions, such as infectious complications of immunosuppressive drug therapy. In diabetic nephropathy with nephrotic syndrome, patients usually have a good response to angiotensin blockade, with reduction of proteinuria and some slowing of the loss of renal function. True remission is uncommon, however. Cardiovascular morbidity and mortality increase as kidney function declines, and some patients will eventually need dialysis or a kidney transplant. In primary amyloidosis, prognosis is not good, even with intensive chemotherapy. In secondary amyloidosis, remission of the underlying cause, such as rheumatoid arthritis, is followed by remission of the amyloidosis and its associated nephrotic syndrome. Pediatric nephrotic syndrome is a chronic illness characterized by relapses and remissions, which can extend throughout childhood. There will be illness from the disease and from its treatment. Parents may monitor their child's urine and record the results in a diary. The diary can also be used to write down an agreed-upon plan for the management of relapses. Information booklets should be given to the family. Peer support and psychological counseling may be helpful. Nephrotic syndrome in adults can also wax and wane, with the complications as reviewed above. Progression to renal failure will require preparation for dialysis and/or kidney transplantation. Wu MY, Chen CS, Yiang GT, Cheng PW, Chen YL, Chiu HC, et al. The Emerging Role of Pathogenesis of IgA Nephropathy. J Clin Med. 2018 Aug 20. 7 (8):716-21. [Medline]. [Full Text]. Haraldsson B, Nyström J, Deen WM. Properties of the glomerular barrier and mechanisms of proteinuria. Physiol Rev. 2008 Apr. 88(2):451-87. [Medline]. Russo LM, Bakris GL, Comper WD. Renal handling of albumin: a critical review of basic concepts and perspective. Am J Kidney Dis. 2002 May. 39(5):899-919. [Medline]. Norden AG, Lapsley M, Lee PJ, Pusey CD, Scheinman SJ, Tam FW. Glomerular protein sieving and implications for renal failure in Fanconi syndrome. Kidney Int. 2001 Nov. 60(5):1885-92. [Medline]. Hamm LL, Batuman V. Edema in the nephrotic syndrome: new aspect of an old enigma. J Am Soc Nephrol. 2003 Dec. 14(12):3288-9. [Medline]. Rostoker G, Behar A, Lagrue G. Vascular hyperpermeability in nephrotic edema. Nephron. 2000 Jul. 85(3):194-200. [Medline]. Appel GB, Blum CB, Chien S, Kunis CL, Appel AS. The hyperlipidemia of the nephrotic syndrome. Relation to plasma albumin concentration, oncotic pressure, and viscosity. N Engl J Med. 1985 Jun 13. 312(24):1544-8. [Medline]. Curry RC Jr, Roberts WC. Status of the coronary arteries in the nephrotic syndrome. Analysis of 20 necropsy patients aged 15 to 35 years to determine if coronary atherosclerosis is accelerated. Am J Med. 1977 Aug. 63(2):183-92. [Medline]. Mittal SK, Dash SC, Tiwari SC, Agarwal SK, Saxena S, Fishbane S. Bone histology in patients with nephrotic syndrome and normal renal function. Kidney Int. 1999 May. 55(5):1912-9. [Medline]. Tessitore N, Bonucci E, D'Angelo A, Lund B, Corgnati A, Lund B, et al. Bone histology and calcium metabolism in patients with nephrotic syndrome and normal or reduced renal function. Nephron. 1984. 37(3):153-9. [Medline]. Gulati S, Godbole M, Singh U, Gulati K, Srivastava A. Are children with idiopathic nephrotic syndrome at risk for metabolic bone disease?. Am J Kidney Dis. 2003 Jun. 41(6):1163-9. [Medline]. Leonard MB, Feldman HI, Shults J, Zemel BS, Foster BJ, Stallings VA. Long-term, high-dose glucocorticoids and bone mineral content in childhood glucocorticoid-sensitive nephrotic syndrome. N Engl J Med. 2004 Aug 26. 351(9):868-75. [Medline]. Mahmoodi BK, ten Kate MK, Waanders F, Veeger NJ, Brouwer JL, Vogt L. High absolute risks and predictors of venous and arterial thromboembolic events in patients with nephrotic syndrome: results from a large retrospective cohort study. Circulation. 2008 Jan 15. 117(2):224-30. [Medline]. Glassock RJ. Antiphospholipase A2 receptor autoantibody guided diagnosis and treatment of membranous nephropathy: a new personalized medical approach. Clin J Amer Soc Nephrol. 2014. 9:1341-3. [Medline]. Hunley TE, Corzo D, Dudek M, Kishnani P, Amalfitano A, Chen YT, et al. Nephrotic syndrome complicating alpha-glucosidase replacement therapy for Pompe disease. Pediatrics. 2004. 114:e532-5. [Medline]. Lathara Z, Ambruzs JM, Cohen EP. Alloimmune Membranous Nephropathy in Fabry Disease. J Am Soc Nephrol Abstract Supplement. 2015. SA-PO004. [Full Text]. George BA, Zhou XJ, Toto R. Nephrotic syndrome after bevacizumab: case report and literature review. Am J Kidney Dis. 2007 Feb. 49(2):e23-9. [Medline]. Lefaucheur C, Stengel B, Nochy D, et al. Membranous nephropathy and cancer: Epidemiologic evidence and determinants of high-risk cancer association. Kidney Int. 2006 Oct. 70(8):1510-7. [Medline]. Kumar J, Gulati S, Sharma AP, Sharma RK, Gupta RK. Histopathological spectrum of childhood nephrotic syndrome in Indian children. Pediatr Nephrol. 2003 Jul. 18(7):657-60. [Medline]. Ozkaya N, Cakar N, Ekim M, Kara N, Akkök N, Yalçinkaya F. Primary nephrotic syndrome during childhood in Turkey. Pediatr Int. 2004 Aug. 46(4):436-8. [Medline]. Kazi JI, Mubarak M. Pattern of glomerulonephritides in adult nephrotic patients--report from SIUT. J Pak Med Assoc. 2007 Nov. 57(11):574. [Medline]. Barsoum R. The changing face of schistosomal glomerulopathy. Kidney Int. 2004. 66:2472-2484. Doe JY, Funk M, Mengel M, et al. Nephrotic syndrome in African children: lack of evidence for 'tropical nephrotic syndrome'?. Nephrol Dial Transplant. 2006. 21:672-676. Pakasa NM, Sumaili EK. The nephrotic syndrome in the Democratic Republic of Congo. N Engl J Med. 2006 Mar 9. 354(10):1085-6. [Medline]. Sumaili EK, Krzesinski JM, Zinga CV, Cohen EP, Delanaye P, Munyanga SM, et al. Prevalence of chronic kidney disease in Kinshasa: results of a pilot study from the Democratic Republic of Congo. Nephrol Dial Transplant. 2009 Jan. 24(1):117-22. [Medline]. Fine DM, Wasser WG, Estrella MM, Atta MG, Kuperman M, Shemer R, et al. APOL1 risk variants predict histopathology and progression to ESRD in HIV-related kidney disease. J Am Soc Nephrol. 2012. 23:343-50. [Medline]. Bonilla-Felix M, Parra C, Dajani T, Ferris M, Swinford RD, Portman RJ. Changing patterns in the histopathology of idiopathic nephrotic syndrome in children. Kidney Int. 1999 May. 55(5):1885-90. [Medline]. Arneil GC, Lam CN. Long-term assessment of steroid therapy in childhood nephrosis. Lancet. 1966 Oct 15. 2(7468):819-21. [Medline]. Gipson DS, Troost JP, Lafayette RA, et al. Complete Remission in the Nephrotic Syndrome Study Network. Clin J Am Soc Nephrol. 2016. 11:81-9. [Medline]. Beins NT, Dell KM. Long-Term Outcomes in Children with Steroid-Resistant Nephrotic Syndrome Treated with Calcineurin Inhibitors. Front Pediatr. 2015. 3:104. [Medline]. Donadio JV Jr, Torres VE, Velosa JA, Wagoner RD, Holley KE, Okamura M. Idiopathic membranous nephropathy: the natural history of untreated patients. Kidney Int. 1988 Mar. 33(3):708-15. [Medline]. Jude EB, Anderson SG, Cruickshank JK, et al. Natural history and prognostic factors of diabetic nephropathy in type 2 diabetes. Quart J Med. 2002. 95:371-7. [Medline]. Varghese SA, Powell TB, Budisavljevic MN, et al. Urine biomarkers predict the cause of glomerular disease. J Am Soc Nephrol. 2007. 18:913-22. [Medline]. Cohen EP, Lemann J. The role of the laboratory in evaluation of kidney function. Clin Chem. 1991. 37:785-796. Gupta K, Iskandar SS, Daeihagh P, et al. Distribution of pathologic findings in individuals with nephrotic proteinuria according to serum albumin. Nephrol Dial Transplant. 2008 May. 23(5):1595-9. [Medline]. Beck LH Jr, Bonegio RG, Lambeau G, et al. M-type phospholipase A2 receptor as target antigen in idiopathic membranous nephropathy. N Engl J Med. 2009 Jul 2. 361(1):11-21. [Medline]. [Full Text]. Hofstra JM, Beck LH Jr, Beck DM, Wetzels JF, Salant DJ. Anti-phospholipase A2 receptor antibodies correlate with clinical status in idiopathic membranous nephropathy. Clin J Am Soc Nephrol. 2011 Jun. 6(6):1286-91. [Medline]. [Full Text]. [Guideline] Kidney Disease Improving Global Outcomes. KDIGO Clinical Practice Guideline for Glomerulonephritis. Kidney International. Available at http://www.kdigo.org/clinical_practice_guidelines/pdf/KDIGO-GN-Guideline.pdf. June 2012; Accessed: December 14, 2018. Palmer SC, Nand K, Strippoli GF. Interventions for minimal change disease in adults with nephrotic syndrome. Cochrane Database Syst Rev. 2008 Jan 23. CD001537. [Medline]. Waldman M, Crew RJ, Valeri A, Busch J, Stokes B, Markowitz G, et al. Adult minimal-change disease: clinical characteristics, treatment, and outcomes. Clin J Am Soc Nephrol. 2007 May. 2(3):445-53. [Medline]. Ravani P, Bonanni A, Rossi R, Caridi G, Ghiggeri GM. Anti-CD20 Antibodies for Idiopathic Nephrotic Syndrome in Children. Clin J Am Soc Nephrol. 2015 Nov 19. 160 (5 Pt 1):1062-7. [Medline]. Ruggenenti P, et al; Rituximab in Nephrotic Syndrome of Steroid-Dependent or Frequently Relapsing Minimal Change Disease Or Focal Segmental Glomerulosclerosis (NEMO) Study Group. Rituximab in steroid-dependent or frequently relapsing idiopathic nephrotic syndrome. J Am Soc Nephrol. 2014 Apr. 25 (4):850-63. [Medline]. Bonanni A, Rossi R, Murtas C, Ghiggeri GM. Low-dose ofatumumab for rituximab-resistant nephrotic syndrome. BMJ Case Rep. 2015 Sep 16. 2015:[Medline]. Hibino S, Uemura O, Nagai T, Yamakawa S, Iwata N, Ito H, et al. Three year outcome of childhood idiopathic nephrotic syndrome under a unified immunosuppressive protocol. Pediatr Int. 2014 Sep 15. [Medline]. du Buf-Vereijken PW, Branten AJ, Wetzels JF. Idiopathic membranous nephropathy: outline and rationale of a treatment strategy. Am J Kidney Dis. 2005 Dec. 46(6):1012-29. [Medline]. Fervenza FC, Abraham RS, Erickson SB, et al. Rituximab therapy in idiopathic membranous nephropathy: a two year study. Clin J Am Soc Nephrol. 2010. 5:2188-2198. [Medline]. National Center for Immunization and Respiratory Diseases. General recommendations on immunization --- recommendations of the Advisory Committee on Immunization Practices (ACIP). MMWR Recomm Rep. 2011 Jan 28. 60 (2):1-64. [Medline]. [Full Text]. Centers for Disease Control and Prevention (CDC). Use of 13-valent pneumococcal conjugate vaccine and 23-valent pneumococcal polysaccharide vaccine for adults with immunocompromising conditions: recommendations of the Advisory Committee on Immunization Practices (ACIP). MMWR Morb Mortal Wkly Rep. 2012 Oct 12. 61 (40):816-9. [Medline]. [Full Text]. Cohen JI. Strategies for herpes zoster vaccination of immunocompromised patients. J Infect Dis. 2008 Mar 1. 197 Suppl 2:S237-41. [Medline]. Liu D, Ahmet A, Ward L, Krishnamoorthy P, Mandelcorn ED, Leigh R, et al. A practical guide to the monitoring and management of the complications of systemic corticosteroid therapy. Allergy Asthma Clin Immunol. 2013 Aug 15. 9 (1):30. [Medline]. [Full Text]. Chen Y, Schieppati A, Chen X, Cai G, Zamora J, Giuliano GA, et al. Immunosuppressive treatment for idiopathic membranous nephropathy in adults with nephrotic syndrome. Cochrane Database Syst Rev. 2014 Oct 16. 10:CD004293. [Medline]. Gulati A, Sinha A, Jordan SC, Hari P, Dinda AK, Sharma S, et al. Efficacy and safety of treatment with rituximab for difficult steroid-resistant and -dependent nephrotic syndrome: multicentric report. Clin J Am Soc Nephrol. 2010 Dec. 5(12):2207-12. [Medline]. [Full Text]. Bomback AS, Tumlin JA, Baranski J, et al. Treatment of nephrotic syndrome with adrenocorticotropic hormone (ACTH) gel. Drug Des Devel Ther. 2011 Mar 14. 5:147-53. [Medline]. [Full Text]. Bomback AS, Canetta PA, Beck LH Jr, Ayalon R, Radhakrishnan J, Appel GB. Treatment of resistant glomerular diseases with adrenocorticotropic hormone gel: a prospective trial. Am J Nephrol. 2012. 36(1):58-67. [Medline]. Vaziri ND. Disorders of lipid metabolism in nephrotic syndrome: mechanisms and consequences. Kidney Int. 2016 Jul. 90 (1):41-52. [Medline]. Agrawal S, Zaritsky JJ, Fornoni A, Smoyer WE. Dyslipidaemia in nephrotic syndrome: mechanisms and treatment. Nat Rev Nephrol. 2018 Jan. 14 (1):57-70. [Medline]. Chen M, Li H, Li XY, et al. Tacrolimus Combined With Corticosteroids in Treatment of Nephrotic Idiopathic Membranous Nephropathy: A Multicenter Randomized Controlled Trial. Am J Med Sci. 2010 Mar. 339(3):233-8. [Medline]. Roberti I, Vyas S. Long-term outcome of children with steroid-resistant nephrotic syndrome treated with tacrolimus. Pediatr Nephrol. 2010 Mar 9. [Medline]. Rood IM, Deegens JKJ, Lugtenberg D, Bongers EMHF, Wetzels JFM. Nephrotic Syndrome With Mutations in NPHS2: The Role of R229Q and Implications for Genetic Counseling. Am J Kidney Dis. 2018 Sep 18. [Medline]. Hahn D, Hodson EM, Willis NS, Craig JC. Corticosteroid therapy for nephrotic syndrome in children. Cochrane Database Syst Rev. 2015 Mar 18. CD001533. [Medline]. Yadav M, Sinha A, Khandelwal P, Hari P, Bagga A. Efficacy of low-dose daily versus alternate-day prednisolone in frequently relapsing nephrotic syndrome: an open-label randomized controlled trial. Pediatr Nephrol. 2018 Sep 7. 6 (1):63-9. [Medline]. Dufek S, Holtta T, Trautmann A, et al. Management of children with congenital nephrotic syndrome: challenging treatment paradigms. Nephrol Dial Transplant. 2018 Jun 21. [Medline].